Passionate sailor. I love getting out on the water and sharing the magical experience of being at sea with friends and family. I planned a party for my graduation on this spectacular boat and everyone had a fantastic time! From start to finish the Sailo team helped plan the event and make it a memorable day. The boat was beautiful, the staff friendly, the drinks were flowing, and everyone loved seeing the statue of liberty and the Manhattan skyline from the water. 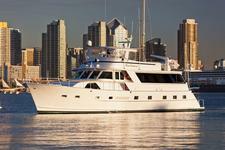 I would definetely recommend planning an event on this boat and with Sailo! Thank you!